I've had this one for about 4 years, though I haven't used it much because I bought a pair of Gramercy Tools holdfasts that work much better. However, I'm working on mortising the legs for a second portable workbench for the class I'm teaching, and those were out in the van with the other bench. No problem, I thought, I'll just use this one. It only survived two mortises. Give it a bash, work on the mortise, the stupid thing slips, bash it in again. Then the top just popped off, clean break at the neck. Cast iron is just too stiff and brittle for holdfasts. Stiff means that the holdfast doesn't hold well. It sets poorly and then slips out easily. Brittle means that it doesn't stand up to the repeated resetting required. A holdfast like this is just annoying to use. It's one of those cheap pieces of junk that reinforces the belief that hand tools are hard to use. For a proper holdfast, get thee down to the spreading chestnut tree where the village smithy stands. He'll forge you a wrought iron holdfast with the ductility and spring to set well and take a beating. What, no village smithy? Then the modern equivalent is the Gramercy Tools holdfast. Made from mild steel rod and shaped in an automated wire forming machine, these things work great and will take anything you can dish out (read the patent for the manufacturing process here). 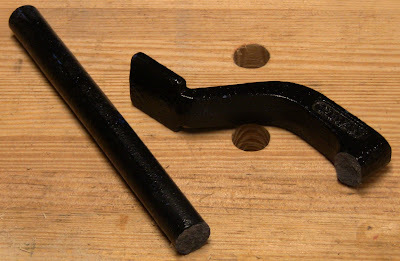 Gramercy Tools holdfast: the right material for the tool. Get at least two. Might as well order a couple extra, so you can keep a pair in the shop and a pair in the van (I'm sure you can come up with a valid reason to drive around with them). When they arrive, wipe off any machine oil residue, then wrap some sandpaper around the shank and give them a spin to roughen the surface with scratch rings. They'll hold like pit bull velcro. Interesting post. I can't speak from experience, but I'm not surprised by your findings. Cast iron is not knowing for it's flexibility. I do however, use the veritas cast iron hold downs and find them well. But they rely on a different mechanism so can't be compared. I assume you mean the Veritas Hold-Down with the pivoting arm and brass screw? I haven't used those, but I've seen other people recommend them as well. 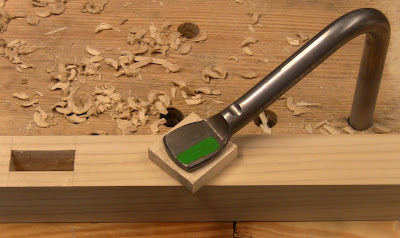 The pivot provides the wedging action that the flex in a solid piece would provide, and the screw provides the wedging force that a mallet would provide, in a kinder, gentler form. I also note on the Lee-Valley website that the top is "high strength aluminum-zinc alloy", while the post is machined steel. Looks like a well-engineered alternative that doesn't rely on the violent force of a mallet, made with good materials. Interesting I never paid that much attention. The weight texture and feel of the Veritas is that of cast iron. However, as per LV it is a zinc-aluminium alloy (http://www.leevalley.com/us/wood/page.aspx?p=31149&cat=1,43838,43847&ap=1.) I stand corrected. I recently ordered a pair of the TFWW holdfasts. I needed some #4 double extra slim files to re tooth a tenon saw I screwed up... I revised my filing technique. The saw and my x-cut filing method are greatly improved. I can't wait to build a good bench to use them on but they work wonderfully on my saw bench. I have a scheme to trade some jewelry boxes for some 8/4 oak... should be interesting. The premise that cast holdfasts won't-don't work is erroneous. Granted the one that was referenced here is an inferior product but a ductile iron casting would be very suitable for the purpose. Making a holdfast is a more than just bending a gooseneck into a steel rod. There are bigger issues of proper flexibility and even the texture of the round shaft that penetrates the bench. The thickness of the bench is a factor also. I will agreee that the Veritas screw holdfast is a fine product. Its height is the only drawback, but the thing holds mightily. Lastly, Lie-Nielsen's cast holdfasts are highly recommended also.